Kinetics Furniture was one of the early innovators in powder coating technology 13 years ago when it began applying a modified powder on its hi-tech look contract furniture. The Rexdale, Ont., firm sells Canadian designed furniture by contract to hard-use customers such as airports, schools, hospitals, offices, etc. Why powder, as opposed to the time-honored use of chrome? The answer lies in the high gloss, durable finish. That is where trial and error entered the picture. The old adage that ‘the only way to do something right is to do it yourself’ is a sustaining belief held by Kinetics. The company went through eight years of system adjustments until it got it to a point that satisfied it’s zest for quality. The largest problem involved the number of air changes per minute the oven would require. Another key to Kinetics’ success lies in it’s ability to adapt developing technology to the line. The company has seen a 50 percent growth in sales in each of the last seven years, according to Good, and is currently on the third generation of equipment. The newest addition is a second Volstatic spray booth, designed to increase production by being utilized as an emergency booth for short runs. The Kinetics finishing system includes a two-stage washer, a two-stage pre-heat drying oven, two spray booths and a 60-foot final cure oven. The two-stage washer utilizes a phosphate etching system, custom built to the sizes of the largest and smallest Kinetics products, and to the variations in line speed. There is no need to program for different chemicals because the company deals mainly with cold rolled steel and some aluminum. After the iron phosphate wash, the unfinished furniture, primarily tubular steel, is taken through the clean water rinse. A Volstatic gas-fired oven dries the metal at 500° F for five minutes after the rinse. The steel must be perfectly dry after this stage for proper bonding. If moisture gets trapped inside the tube there would be a cold spot, which would cause a fluctuation in the finish, either in the surface texture or the gloss. Once a part leaves the oven it loses temperature at an average of 25° F per foot, a number that varies with heavy gauge metals, which retain heat longer (and take longer to heat). The parts are conveyed throughout on a PAC-LINE™ variable speed conveyor system. Kinetics usually preheats parts to 300° F before coating, again depending on substrate and line speed variables. This variation is decreasing because Kinetics wants the line to remain fairly constant for production efficiency throughout the plant, depending more on the variable temperature range of the oven. The company has also been finding slight curing fluctuations with color changes. The need for experienced decision making is a factor in why it is very difficult to break directly into in-house powder coating technology, says Good. 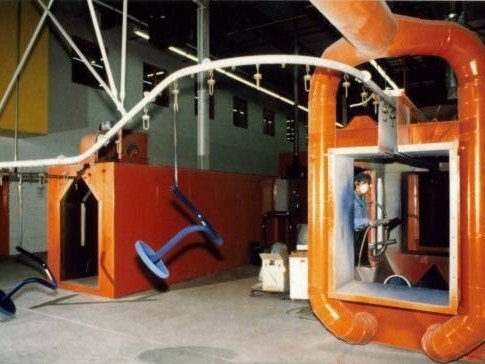 After leaving the pre-heat oven, furniture enters the electrostatic spray booth where one of three painters spray the modified epoxy powder. Kinetics had it modified to withstand heat, retain its gloss, and maintain the general epoxy abrasion and impact resistance, all within the parameters of an average heavy dry film thickness. The powder application technique is standard fare, with the exception of the preheating to 300° F.
“We coat hot, which is different than most powder applicators,” says Ross Kirwin, director of manufacturing. “But we find the heat enhances the mil build of paint. The first bonding of the particles to the steel is electrostatic. That first layer melts and the secondary attraction is from the tackiness of the melted powder particles. Generally, it allows us to get mil builds in the order of twice normal for powder coatings. One of the problems generally associated with powder coatings is color change, however Kinetics is quite proud of it’s basic selection of 20 colors with a base of 16 more colors upon special request. Thirteen years ago it might have taken more than an hour to change colors, but now, with the refinements that experience brings, this has been reduced to a more manageable 20 minutes. A strong marketing point of powder coating has been the ability to re-cycle overspray saving material costs, but Kinetics cannot utilize this advantage because of the high grade of product purity it requires. If the system is purged and misses even a few particles, these will emerge into the next color, not as blending, but with a speckled effect. There is a strong shop bonus system at Kinetics based on production, not rejection rates. The system is designed to reward the entire shop collectively as opposed to individual awards. As far as the future is concerned, Kinetics is relying, so to speak, on the past. Experience is a wonderful thing to have when used wisely. Constantly adapting the finishing line to changing technologies has been the company strong point for the past 13 years. The early systems were difficult to purge, so the company obtained larger pumps. As Kinetics started selling furniture it was discovered that customers buy in relatively small orders when considered in terms of production runs, so the company went to smaller batching pots. The recent acquisition of a second finishing booth will speed production by allowing uninterrupted runs on the first booth, relieving it of emergency and small part finishing jobs. The company could conceivably even change coatings. “One of the things we’ve been looking at are the new low temperature epoxy systems. Whether or not we can get the same quality we are used to remains to be seen. The impact of low temperature curing epoxies is that you can cure and apply at half the temperature, which means your line can move twice as fast,” says Kirwin.